As of the Sunday before the final week before the November 8 election, more than 21 million people have voted in the 2016 election. Several states and localities are seeing early voting levels well above 2012 records. Some are expected to far outpace their 2012 levels, such as Minnesota, which recently adopted no-excuse absentee voting. In the week ahead, expect the early voting pace to pick up even further as more people tend to vote early as Election Day nears. We are also starting to see indications of a shift in the composition of the demographics of the early electorate. On Saturday, the percentage of early voters age 60 or older in Georgia and North Carolina dropped by about two percentage points. This is also to be expected, as Election Day nears usually more young people, persons of color, and people who do not register with a political party vote early. Did the Comey letter depress Democratic enthusiasm? On Friday, FBI director James Comey sent a letter to Congress notifying them of the existence of potential new information regarding Clinton's email server. This unleashed a media uproar and wide speculation among pundits that the race would be upended as Democrats became demoralized by the news. A way to gauge the effect of the announcement is to see if Democrats voted in-person at lower levels than 2012 on the next day, Saturday. 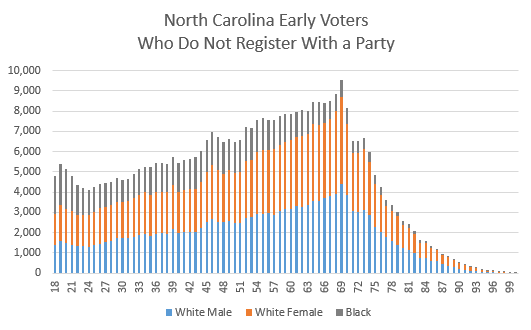 There are two states -- Nevada and North Carolina -- reporting early voting by party registration that provide some clues as to a potential effect. 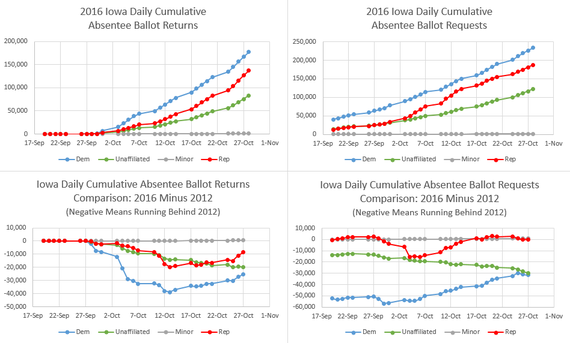 It is important to understand that these are preliminary numbers that may be revised upwards as election officials catch up with their weekend data entry. Thus, if the preliminary numbers show no downward effect, then the notion of a downward effect can more readily be dispelled. Let me also say, these data can only provide clues of shifts of early voter turnout (enthusiasm) levels among various groups, they provide no information on shifts of candidate choice. This said, the preliminary evidence is little or no effect of Comey's letter depressing Democratic enthusiasm. Nevada has yet to report up-to-date numbers for all counties, but two important counties, Clark (Las Vegas) and Washoe (Reno) are reporting Saturday early voting data. To gauge the effect Comey's letter, I focus on the in-person votes since ballots in the mail lag events. In Clark, registered Democrats lead Republicans by 3,666 in-person early votes cast on Friday, and by 4,135 on Saturday. Both parties fell off their 2012 pace from Friday to Saturday. Democrats were 813 ahead of 2012 in-person votes cast on Friday and 113 behind on Saturday. Republicans were 805 ahead on Friday and 460 ahead on Saturday. In Washoe, 2012 same-day comparison data are unavailable at this time (due to a bad link on Washoe's election website). Registered Democrats led Republicans by a mere 20 in-person early votes cast on Friday and 18 on Saturday. Washoe Republicans led Democrats by 880 mail and in-person early votes in 2012, but Democrats are leading by 2,507 so far in 2016. The data are mixed. In Clark, both parties realized a decrease in voting activity from Friday to Saturday, with Democrats dropping off more than Republicans. In Washoe, Democrats appear to continue to exceed their 2012 levels even on Saturday. Where does Nevada stand overall? We don't have complete reporting statistics for the state since three small counties have not reported since Wednesday. That said, Nevada's early voting looks encouraging for Clinton. Obama won the state by 6.7 percentage points in 2012. So, far 7.4 percentage points more Democrats have voted by mail or in-person statewide. At the end of 2012, Democrats outpaced Republicans by 6.8 percentage points (a same-day statewide comparison is unavailable). Clinton has some cushion to give up here, so more Trump supporters need to come out in the week ahead. Before we move on from Nevada, a noteworthy feature is that early voters who did not register with a political party are up from their 2012 levels. So far, 19.8% of early voters are unaffiliated, compared to 19.2% for the entire 2012 early voting period. Trump supporters often claim unaffiliated voters break Republican, but this was not the case in 2012. The state reports overall partisan composition of Nevada's 2012 electorate was 42.3% Democrat, 36.4% Republican, and 21.3% unaffiliated; Democrats led by 5.9 percentage points. Since Barack Obama won the state by 6.9 percentage points over Mitt Romney, unaffiliated voters likely broke for Obama. Part of the misperception that unaffiliated voters must lean Republican comes from polls, which often report that self-identified independents tend to support Republicans. It seems logical to equate self-identified independents with unaffiliated registered voters, however, they are not the same. The latter tend to be younger and have more persons of color than the former. It could be that unaffiliated voters are different this year, but they have to be a lot different to sway Nevada. In North Carolina, registered Democrats hold a commanding 210,902 lead in early votes (mail or in-person) over Republicans among nearly 1.6 million votes cast, a spread of 13.1 percentage points. There is good news for Republicans upon a closer look. At the same time in 2012, Democrats held a more commanding lead of 273,126 early votes out of nearly 1.5 million, a spread of 18.4 points. There are some confounding factors, however. As I discussed last week, changes in the number of polling locations affects the 2016 numbers and their relation to 2012. To review the legal battle: In a law passed since 2012, that a court found was "intentionally discriminatory" in how it targeted the state's African-Americans, the number of in-person early voting days was reduced by a week. The number of hours essentially remained the same, so that there are more hours of early voting crammed into the last week and a half. The local boards adopted in-person early voting plans accordingly. The court, however, ordered that the number of days be restored, and local boards drew up new plans for the extra week, while keeping their original plans in place. Some local boards, at the direction of the chair of the North Carolina Republican Party, decided to open the minimal one polling location to comply with the court order, which did not specify the number of polling locations to open. Among the most conspicuous counties was Guilford (Greensboro), which had 16 in-person early voting locations for duration of early voting in 2012, but opened only one for the first week, and did not open its single office on either the first Saturday or Sunday. As a result, in the first week of early voting in 2016 (from Thursday October, 20 to Wednesday, October 26) a total of 7,889 people voted in Guilford whereas 60,451 voted in 2012 during the same relative time period, a reduction of 52,562 early voters. Since the opening of all sixteen polling places, from Thursday to Saturday, in-person early voting is running at a much higher clip, with 54,574 in-person early voters. During this same period in 2012, 24,312 people voted in-person. Guilford is a county that Obama won with 58% of the vote and about a third of its population is African-American. Add to this that Democrats prefer in-person early voting over mail balloting, a partisan effect is expected from Guilford and other counties reducing the number of in-person early voting polling locations. If we look across the state, for the first week of in-person early voting, Democrats amassed a deficit of 60,360 votes relative to 2012. Republicans were at a deficit of 1,878. Since the restoration of polling locations, Democrats are running ahead by 32,350. However, Republicans are running ahead 61,697. Even while Democrats are making up lost ground, Republicans are running ahead of them! Factoring in mail ballots does not change this pattern much. Democrats ran a deficit of 61,125 compared to 2012 the first week and are running ahead 31,151 in the first three days of the restoration of polling locations. Republicans ran a deficit of 6,446 and are running ahead by 54,928 in the three days since. As for the effect of Comey's letter, Saturday in-person voting among registered Democrats was 711 votes above 2012. We might have expected more given the pent up demand; indeed, Democrats ran ahead by 9,915 on Friday. However, Saturday is apparently not a strong day for North Carolina early voting. Overall turnout dropped from 237,803 on Friday to 134,040 on Saturday (a similar decline occurred in 2012). Even Republicans dropped from running ahead by 23,902 on Friday to 10,923 on Saturday, which is a greater decline in absolute and percentage terms than the Democrats. It does not make much sense from the pundit speculation that Republicans would be more negatively affected than Democrats. A caution on these Saturday numbers is that they will likely be revised upwards as election officials catch up on their weekend data entry. With many confounds, I therefore believe there is weak evidence so far that Comey's letter has affected Democratic engagement in North Carolina. The real story is not whether or not Democrats' level of engagement changed, but rather the higher levels of Republican engagement. Recent polls indicate Clinton is opening up a lead, but the early vote is giving a potential contradictory signal. Some of these polls were fielded before the expansion of early voting polling locations, which Republicans appear to have capitalized on more than the Democrats. I might expect, with early voting being a leading indicator, to see tightening in future polls. A last word on North Carolina. The New York Times Upshot/Siena poll is an outlier, with a +7 point Clinton lead. It is also one of the few polls to match respondents to the voter file to produce estimates by party registration. Trump supports (again) like to claim unaffiliated voters as their own, but this poll has Clinton leading early voters who do not affiliate with a political party by +9 points. I can't verify this exact estimate, but I can provide demographic characteristics of all early voters who do not affiliate with a party. 19.5% are African-American, 40.9% are White females, and 39.6% are White males. 13.9% are under age 30 (a percentage that if past patterns hold, will increase in the coming week). Yes, there are undoubtedly Trump supporters among the unaffiliated, but a nine percentage point advantage is plausible (although it may be too high given other polls). If the polls are right that Clinton has a slight North Carolina lead, which the early vote indicates is narrowing, the election will likely come down to unaffiliated registered voters (again, these are not self-identified independents from a poll!). Unaffiliated voters have consistently outpaced their 2012 levels, even during the period of the reduction of polling places. Currently, 396,482 have voted, which is 110,581 more than in 2012 at this same time. In Colorado, 697,414 people have voted so far as of Friday's report from the Secretary of State's office. That's about a quarter of the votes cast in the 2012 presidential election. Registered Democrats lead Republicans by 27,316 votes, or 3.9 percentage points. Democrats have led throughout the mail balloting period, but Republicans have been steadily chipping away at their lead. Indeed, Friday's report was the first time that more Republicans returned ballots than Democrats, narrowing the 5.0 point Democratic advantage on Thursday's report to 3.9 points on Friday. This is the first presidential election held under the new election system, so we can't fully compare to 2012. (Regrettably, I also did not archive links to past years' daily mail ballot reports.) In 2012, Republicans had a 1.8 point lead in the final vote-by-mail report while Obama won the state by 5.3 points. While 81.3% of votes were cast by mail, I expect nearly 100% this year given the legal changes (some in-person votes will be cast on Election Day). In 2014, Republicans led early voting, ending with a 7.4 point lead the day before Election Day. The election resulted in the parties splitting the Governor and U.S. Senate elections. This is yet another state where unaffiliated voters appear to break Democratic. It seems reasonable, then, to expect Republicans to take a lead in the early vote this coming week. How much of a lead and how far Democrats will make up ground at the end remains to be seen. Republicans probably need about a seven point lead for Trump to have an even chance to win the state. It's going to be hard to get there given the volume of early vote that has already arrived at election offices. 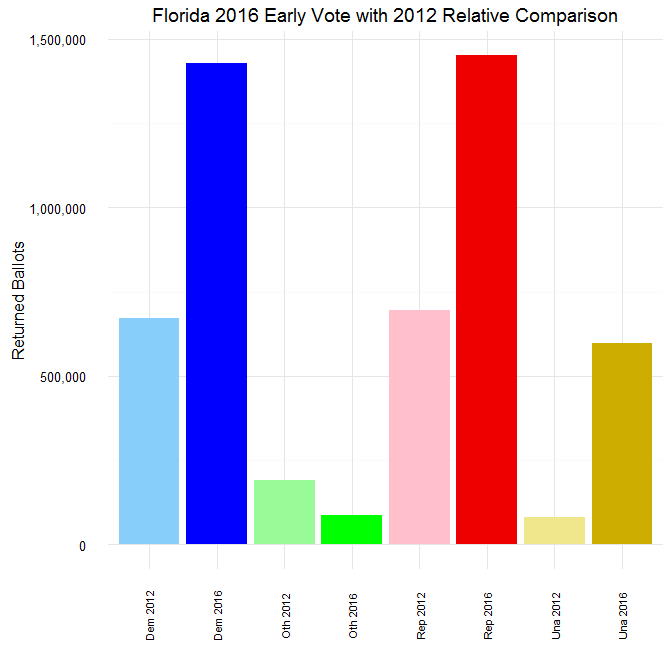 Florida is another state where 2012 comparisons are challenged due to changes in how the state votes. In 2012, the state reduced the number of in-person early voting days, which resulted in long lines and made Florida the posterchild of troubled elections, again. In 2013, the state restored the number of in-person days and also made an absentee ballot request good for two years. Some counties - but not all - have a check box on mail ballot return envelopes that serves as a request renewal. As a result, the early voting levels have skyrocketed: 3.5 million people have already voted as of Saturday in 2016, which is three-quarters of the 2012 early votes. Saturday would have been the first day of early voting in 2016 if the law had not changed, and a million people had already voted in-person by Friday. So, there are no solid 2012 comparisons to be made at this point. Perhaps later in the coming week we'll have a better sense of where the state is heading. This said, as of yesterday Republicans led Democrats by 23,446 mail and in-person early votes, or 0.7 percentage points. At this same point in 2012 after the first day of in-person early voting, Republicans led by 23,794, or 1.5 percentage points. There are 1.9 million more early votes in 2016 than in 2012, making comparisons tricky. I expect the Democrats will take the early voting lead in the coming days for two reasons. First, in-person early voters, where Democrats lead, are continuing to become a larger share of the early voter. 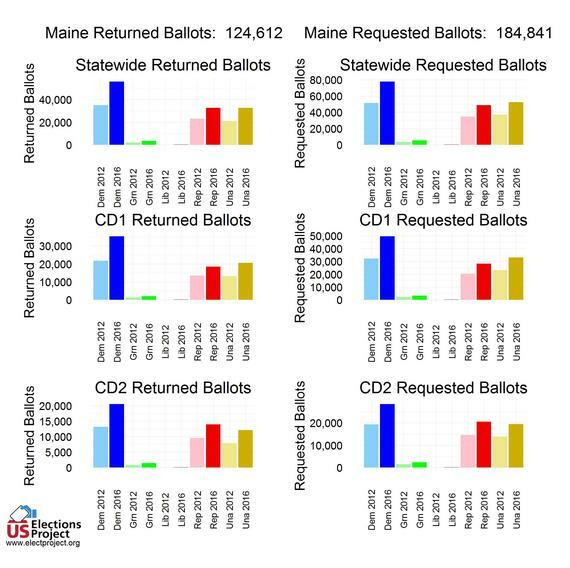 Second, there are 71,700 more Democrats than Republicans who have requested mail ballots but have not returned them. 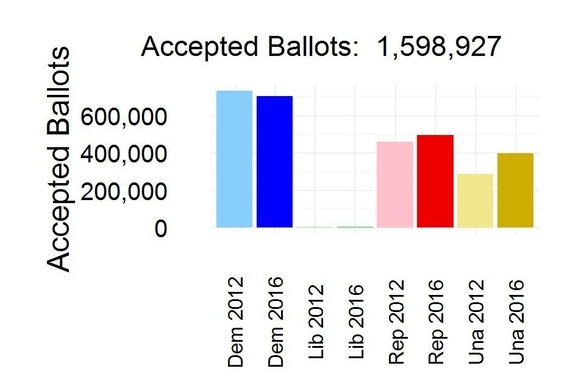 While Democrats typically have a problem with unreturned mail ballots, my sense is given this lopsided number that at some point Democrats will start achieving at least daily parity in the returned mail ballots. In 2012, Democrats had a 3.8 percentage point advantage in both mail and in-person early votes combined. Obama won the state by 0.9 percentage points. It may be tough for Democrats to match their 2012 early vote margin given the volume of votes already cast. Democrats have a little to give, but not a lot. And given the much greater usage of early voting than in 2012, it is not clear to me where the parties need to stand. Given the close polling in the state, I expect that the early vote will not provide a definitive signal as to the outcome, and that the Election Day vote could change the direction of the election. For some reason, the state did not report numbers on October 26, 2012, so I can't make a comparison for that day. That said, not much change here from past reporting. Yes, more registered Democrats than Republicans have returned ballots so far, but this is a state where Democrats are expected to outperform Republicans. Registered Democrats continue to lag their 2012 performance in requested ballots, which is hurting their ballot returns. 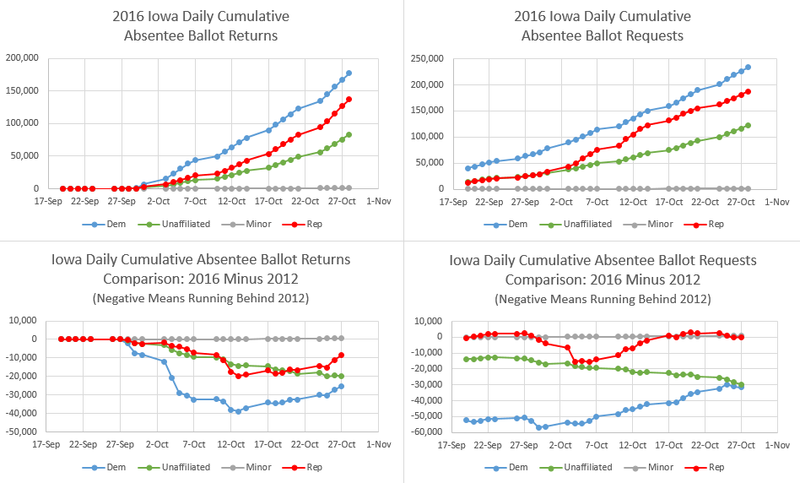 If there is perhaps a glimmer for hope among Democrats is that there is incremental improvement on ballot returns (although ballot requests show a slight decline), and while Republicans are about even on their ballot requests, they are under-performing on their ballot returns. Maybe this will be enough for Clinton, but Iowa still looks to be the best state for Trump to flip from 2012. Ohio Democrats may finally be getting their act together, but they still have a ways to go. We'll get a better read on the state on Monday, when the Secretary of State releases a complete canvass of early voting activity across the state. For now, we have to do with 51 counties we've scraped data for and can compare to 2012. In Cuyahoga (Cleveland) early voting levels are off 12.8% from 2012. While that is awful, it is not as bad as it used to be, as the county has been down more than twenty percent. Franklin (Columbus) is off 7.9% from 2012, but has been down double digits, although not as bad a Cuyahoga. The 49 other counties that we have data for are up 1.0% from 2012, so these large urban counties still have their work cut out for them. I think Trump has a slight edge here, but if improvement continues in Cuyahoga and Franklin during the coming week, Ohio may go down to the wire. I will mention briefly that the last early vote update on October 27 continues to suggest Clinton has improved her standing in the Second Congressional district and the state appears less likely to split its Electoral College votes. Things are bigger in Texas, except voter turnout. In 2012, Texas had the fourth lowest turnout rate in the country, and it perennially ranks near the bottom. Something may be changing, however. So far, more than 2.5 million Texans have voted in the fifteen largest counties, which is up a remarkable 42.6% over 2012. The polls show Texas entering the battleground. Whether or not this is true, the perception that Texas is competitive is likely contributing to higher turnout, as people believe their vote matters more than in the past. This would be consequential for the national turnout rate, too. If Texas matched the national turnout rate, that would result in over a million more votes and would increase the national turnout rate by a point or so. Despite surprises, there appears more stability in the early vote than volatility. I suspect that most people have made up their minds about the candidates and the media frenzy is another piece of information to be thrown on the heap of what we already know about the candidates. I do not equate sexual assault with mishandling of classified information, but it strikes me that the cognitive task before voters is similar. In both cases, voters have a mountain of evidence already placed before them. One more woman making an accusation against Trump will not change voters' assessments of the veracity of the totality of the allegations. Similarly, possibly finding new Clinton-related emails - without any further evidence that they are relevant - does not change voters' assessments of Clinton on this issue. That said, in North Carolina that stability is starting to point in the Republican direction, while in Ohio the Democrats appear to be making up ground. In these close battleground states and others I expect the early vote to provide a similar signal to the polling, in that we will know that the election is close and will be determined by Election Day voters.